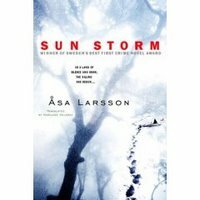 Åsa Larsson's Sun Storm keeps the reader unsettled: every time you think that the plot is settling into a cliché, Larsson provides a twist, not just to startle but to keep the story full of both tension and realism. The book is not a police procedural, but a policewoman is a prominent character and her investigation, along with her colleagues, is central to the book (without providing a resultion to the plot). 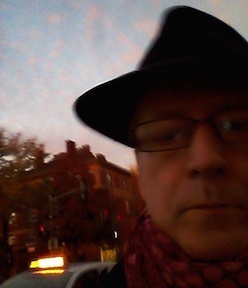 The central character is a lawyer forced into investigataing a murder, somewhat like Liza Marklund's intrepid reporter, constantly being thrown into the middle of a murder. But whereas Marklund's character is implausibly skillful in getting out of tight spots, Larsson's Rebecka Martinsson is simply a woman with a past, caught up in the intrigues of a small town that she thought (and hoped) she had left behind forever. The setting is also intriguing--the far northern town of Kiruna. The main thread of the plot Iand of the book's atmosphere) is religion--specifically a uniquely Swedish brand of revivalist/fundamentalist Christianity of the "crystal cathedral" sort. The lure of a "cult" of that sort for ordinary people and also for a certain kind of psychopath is a key theme of the book--but Larsson skilfully avoids demonizing the religiosity of the church at the center of the plot by using a former convert, Rebecka, as her main character. The Lappland environment recalls a wonderful novel by Kerstin Ekman, Blackwater, that is also a crime story--albeit one that is extended by language and narrative far, far beyond (in page count and content) it's "McGuffin," to use Hitchcock's term for the event that drives a crime story. Ekman's novel is heavy sledding (little pun, please forgive me, given the snow everywhere up there in Lappland) unless you get wrapped up in it--if you do, it's a fascinating portrayal of difficult relations among Swedes, Lapps, and leftover hippie-dropout-types in a local commune. Larsson's novel, far shorter than Ekman's, doesn't present any hurdle of that sort and moves along much more quickly, with more tension. But Larsson's language is also rich, her evocation of the far north equally involving and vivid, and her resolution, though more in line with a thriller perhaps than Ekman's, dramatic rather than melodramatic. All in all, we can thank the current Scandinavian crime boom (started off, presumably, by the success of the Wallander books) for making it possible for English speakers to read a book as good as Sunstorm, and if the book blurb is to be believed, the sequels that Larsson is producing. One thing that is evident in this book as well as several others I've read recently is a casual violence against animals, used as a dramatic device. In the case of Sunstorm, this particular plot device is a weakness, a cliche even--a flaw in the book that is the only really off-putting aspect of the novel. In some other cases, the violence against animals is more integrated into the structure but more "on-screen" and harder to take. Is this a theme that anyone else has noticed in contemporary crime fiction?